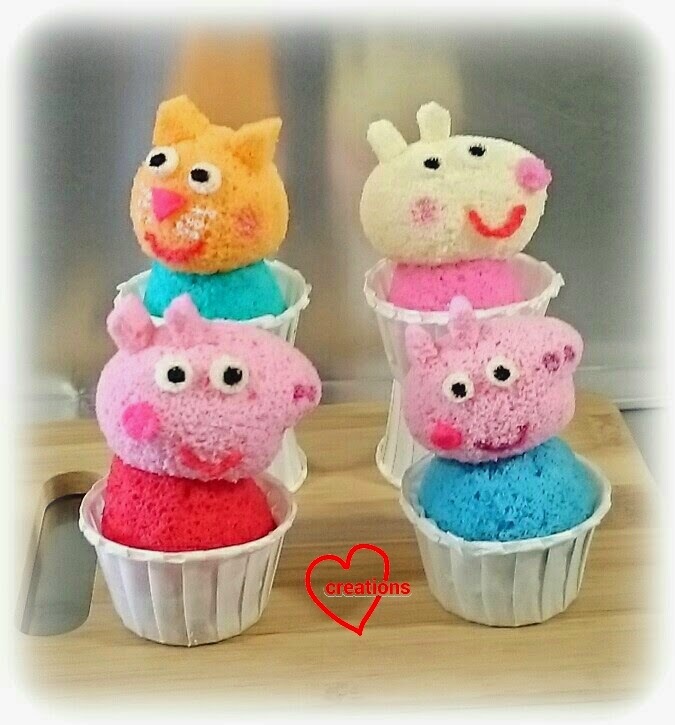 I have a request for Peppa Pig, George and as many of Peppa's friends as I can manage in the form of chiffon cupcakes. Lychee flavour was requested so I made them with this flavour. It's my first attempt at assorted 3D cupcakes so I decided to make only 4 different types. Presenting my humble attempt! I had to make 16 cupcakes in total so it was quite a lot of work! I baked the parts in two baking sessions (body and head) and took 1.5 days to finish the assembly! 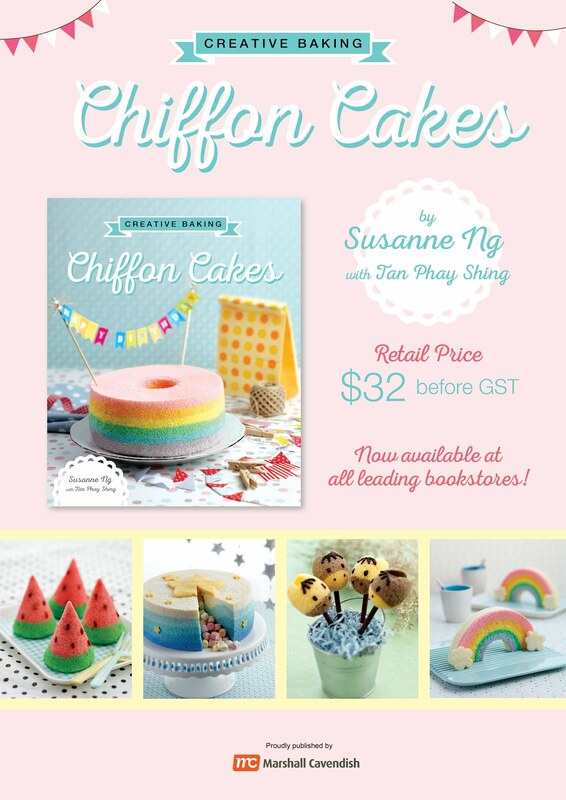 I adapted the recipe for the chiffon cakes from my previous Peppa pig cupcake attempt. Less egg yolk is used in order to create a naturally whiter cake base and I reduced the amount of sugar in the egg yolk batter. I reduced the baking temperature and introduced steam during baking too so the cupcakes are less browned this time! You may ask, how did I manage to get the shapes since shaping sponge cake is not as straightforward as shaping fondant. I made use of paper cones for the girls' bodies and egg shells for George's body. I used egg shells of different orientation/sizes for the heads of the different characters. I made 200g of lychee puree using canned lychees and some syrup from the can. I didn't measure the precise amount. I strained the puree to remove any large bits. Don't discard the syrup from the can! You will need it for brushing the finished cakes later. 1. Prepare the cones and eggshells. Make sure the shells are thoroughly washed with the inner membrane removed. Dry the shells thoroughly before baking in them. 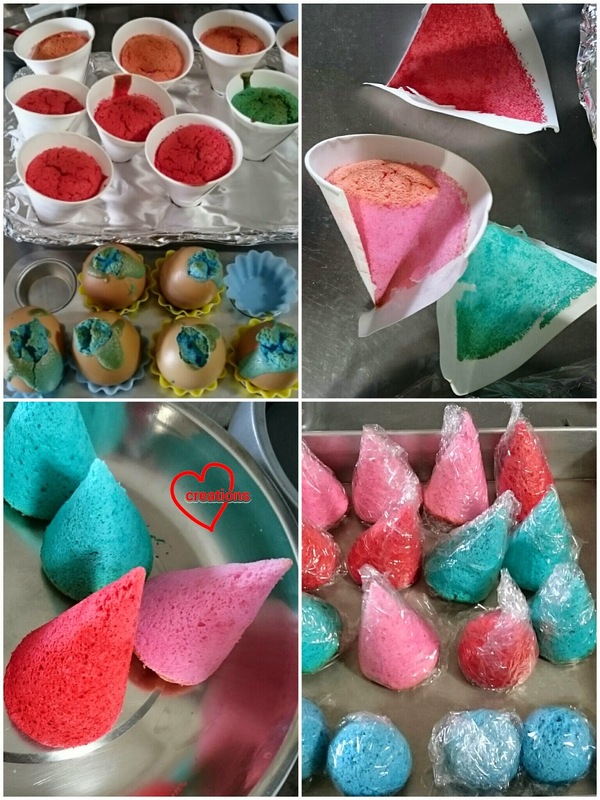 Sit the cones in baking tray covered with aluminum foil to support the cones as shown in top left photo of the collage below. Preheat the oven to 160°C with rack positioned at the second lowest position. I placed 3 bowls of water at the bottom of the oven to create steam. 2. Prepare egg yolk batter. 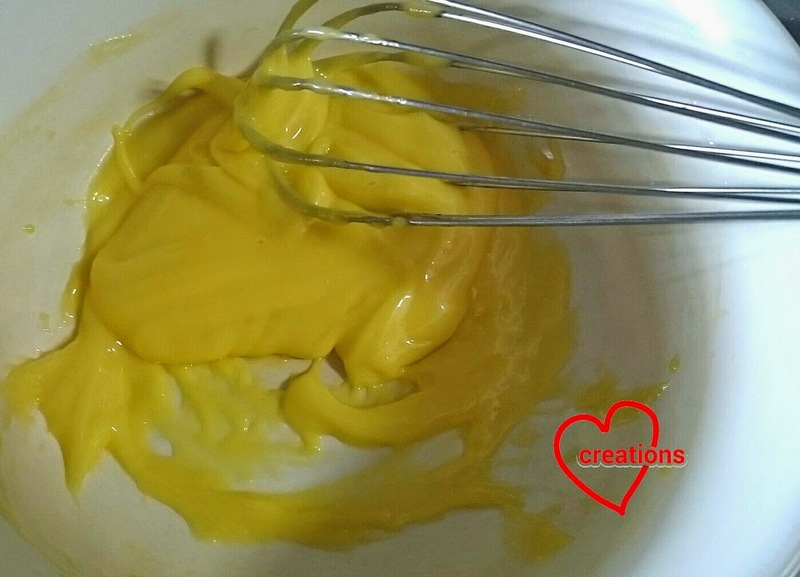 Whisk egg yolk and gradually add in sugar. Whisk until pale and thick. Gradually add oil and whisk until thick like mayonnaise. 3. Gradually add lychee puree and vanilla extract and whisk well. Gradually add sifted flour, salt and baking powder while whisking after each addition. 4. Divide the egg yolk batter into 4 equal portions and colour accordingly: red, pink, blue and teal. I added red yeast powder and naturally sourced pink food powder colouring to reduce the amount of artificial red and pink colouring. 5. Prepare the meringue. Beat egg whites with cream of tartar in a clean metal bowl until soft peaks form with electric mixer. Gradually add sugar and beat until stiff peaks form. 6. Fold the meringue into egg yolk batters in two to three additions. Spoon the batter into the respective cones/eggshells until 1/2-2/3 full. Try to do this as quickly as you can before the meringue breaks down. 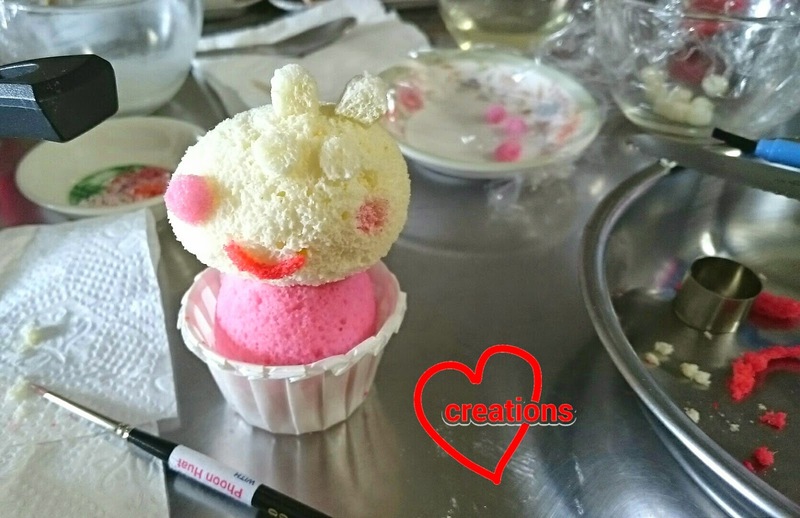 If you are making more than 20 figurines, it may be advisable to bake in separate batches as it is a challenge to fill many eggshells quickly. 7. 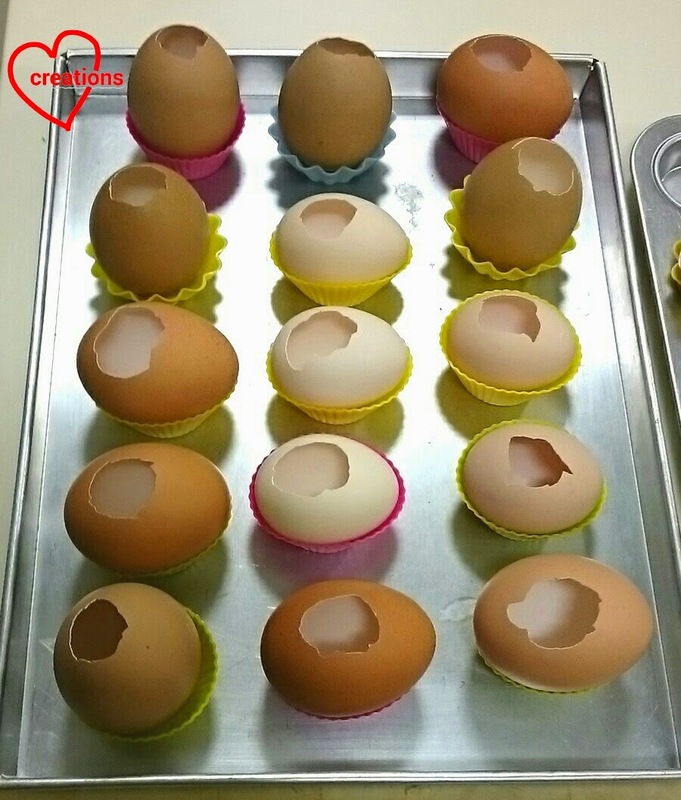 Reduce temperature to 150°C immediately after putting the cones/eggshells in the oven. Bake for 10 minutes at 150°C then reduce the temperature to 135°C and bake for another 9-10 minutes for eggshell and 13-15 minutes for cones. Do test for doneness with a toothpick since my oven and yours behaves differently. 8. 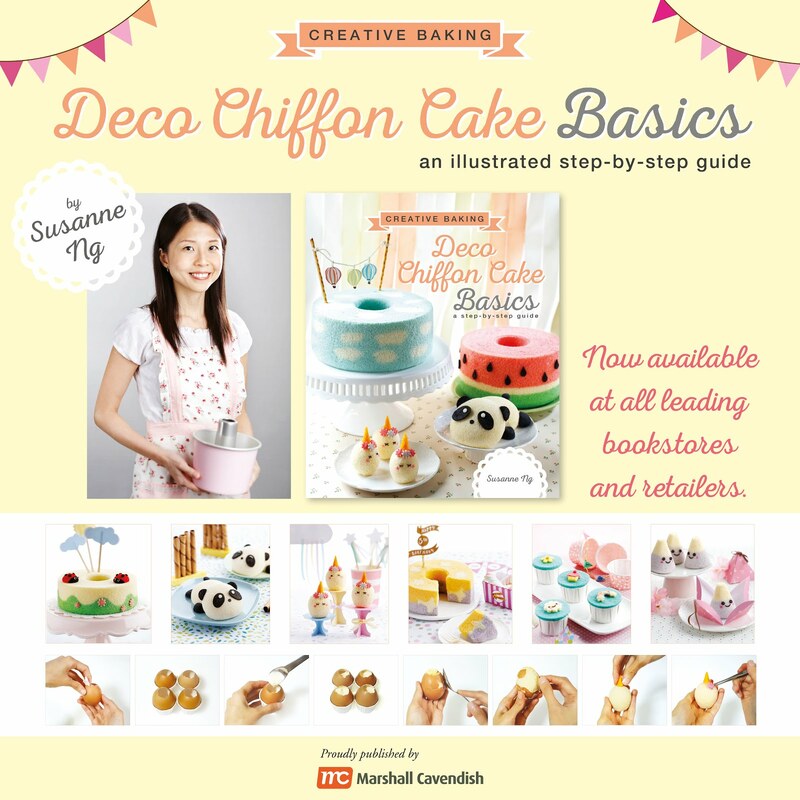 Let the cakes cool completely before unmoulding. To unmould the cones, gently peel from the pointy end (see top right picture in collage below). To unmould from eggshells, use the back of a metal spoon to thoroughly crack the shell then gently peel off the shell. 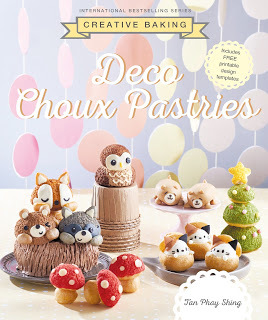 This takes some patience and practice as the cakes are very soft and fragile. Double wrap in cling wrap before storing in airtight container. 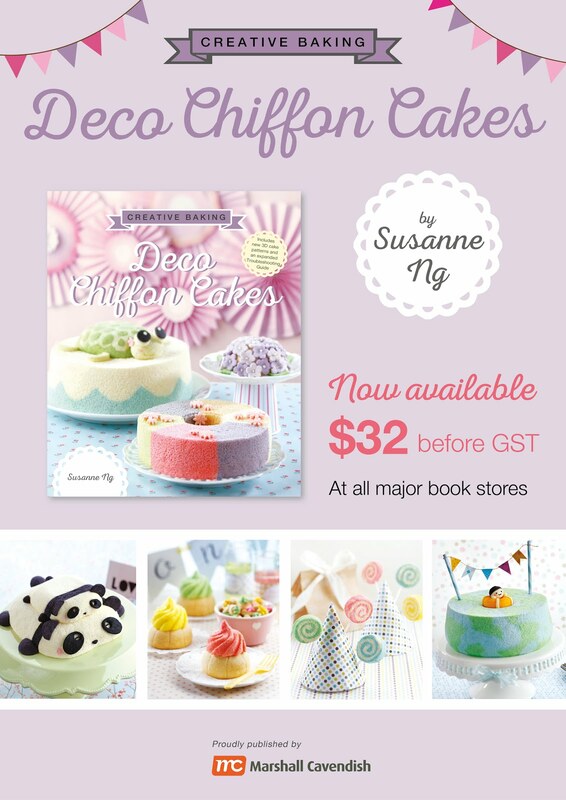 You may freeze the cakes if you are not assembling yet. * I prepared more than necessary egg shells as sometimes the cake gets torn when ummoulding because it sticks to parts where the inner membrane was not removed completely. 1. Prepare eggshells in similar manner as above. Line two 6x6" trays with baking sheet. Vertically oriented eggshells for Candy's head, small horizontally oriented eggshells for George and larger horizontally oriented eggshells for Peppa and Suzy. White: one-third of the batter. 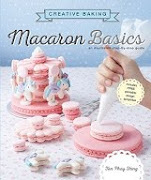 Reserve 1tsp of egg yolk batter and 2.5tbs of meringue to prepare dark pink batter. Pink: two-third of the remaining two-thirds after portioning off for white colour. Orange: one-third of the remaining two-thirds after portioning off for white colour. I know the Math sounds confusing :p. I studied Engineering in my university days and did scientific research before becoming a housewife so trust me on that :p. I actually baked the heads in two separate batches to keep things simple, whipping up the meringue in 2 egg white and 4 egg white portions for white and dark pink batter, and pink and orange batter respectively. Bake the small eggshells for about 15-17 minutes in total. Bake the layer cakes for 9-10 minutes at 150°C and immediately remove from tray. These are for the ears, eyes and some rosy cheeks. I assembled the figurines differently from Susanne as I have 16 to work with instead of 2. She took one whole day just to assemble the two pigs. My shaping and assembly method is simpler here as I didn't want to kill myself :p. I contemplated adding the hands but decided that it was too much work. Some parts are painted on to make things simpler too. It's fairly easy to make Candy and Suzy's head by having the right orientation of eggshells. You may have to cut the cake a bit more for Candy to make it look round, and tuck in the cake a bit at the base. In order to shape Peppa and George, you have to make a slit at the side as shown below and tuck the chin in. It helps to have the whole cake brushed with syrup before doing this. Cut the tops of the cones off. Don't throw away those parts! You will need the tips of the pink cones for Suzy's nose and parts of the red one for the mouths. Attach the heads to the bodies using melted marshmellow and secure it further with a toothpick in the middle. Use cookie cutters and a wet knife to cut out the various facial features and stick them on with melted marshmellow. I used some peach, dusky pink and white lustre dust to brush on rosy cheeks for Candy and Suzy, Candy's whiskers, the Pigs' nostrils and George's mouth. If I had red lustre dust I would have used it for all the mouths but I didn't have. I used charcoal dissolved in water for the eyes. Remember to brush the surface of the cakes with simple syrup (1:1 ratio of sugar and water) to keep the cakes moist. 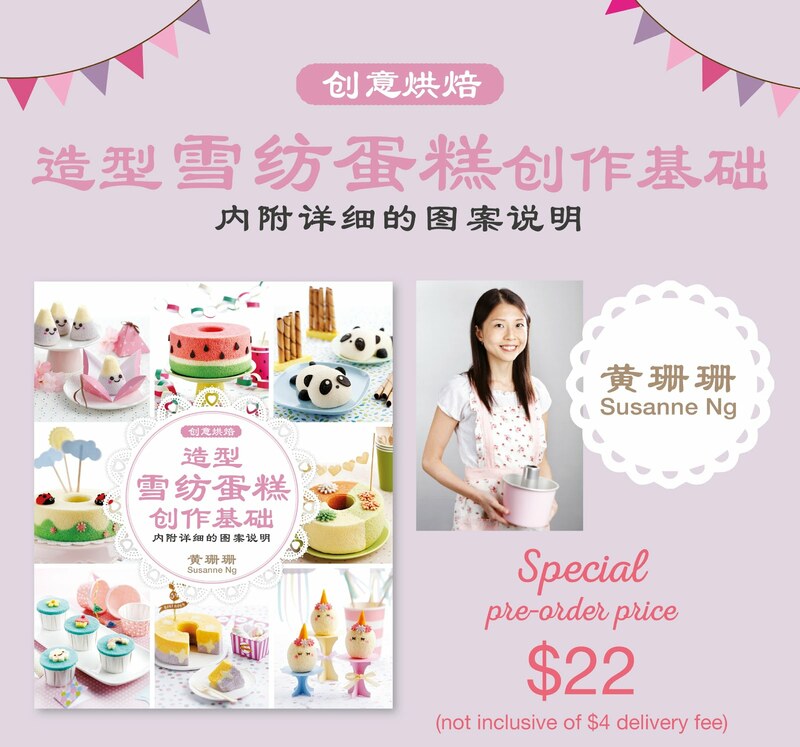 You may use the syrup from canned lychees to increase the lychee flavour of the cakes. Store in airtight container in the fridge. It can keep for a few days. I just placed the aluminum boxes in jumbo zip lock bags to create an airtight environment. I have to be more careful with making sure that the ears are stuck on firmly with melted marshmellow. Some of Suzy's ears fell :p Thank God that the cupcakes were patched in time for the party and they were well received in terms of looks and taste! Everyone thought they were really cute! These were served together with Susanne's awesome cake. 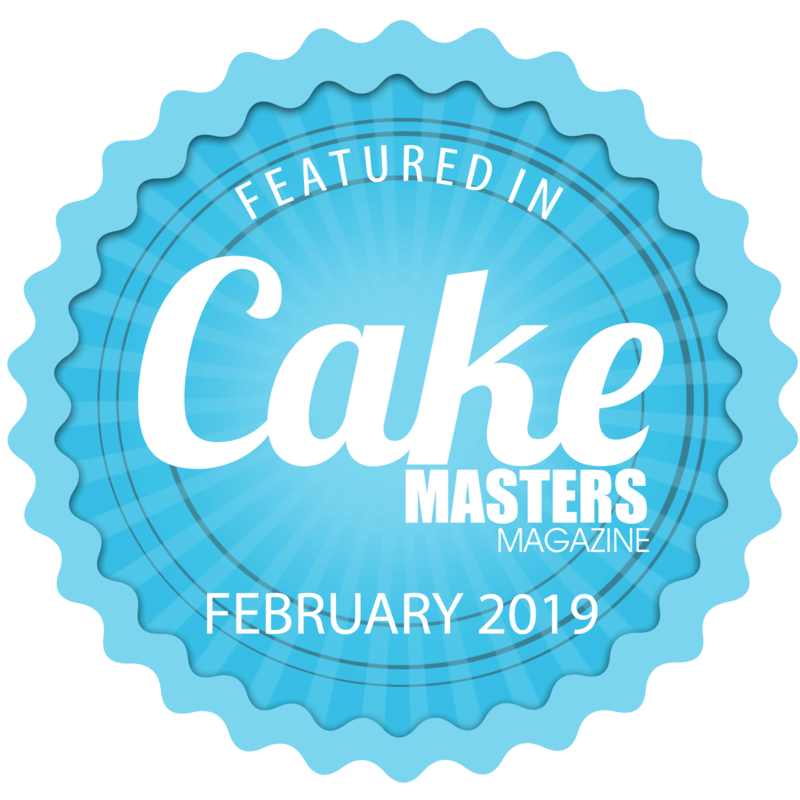 So glad that the guests were delighted with our bakes! pls email me on your charges to do this cupcakes!!! omg!!! im so in love with them!!!! 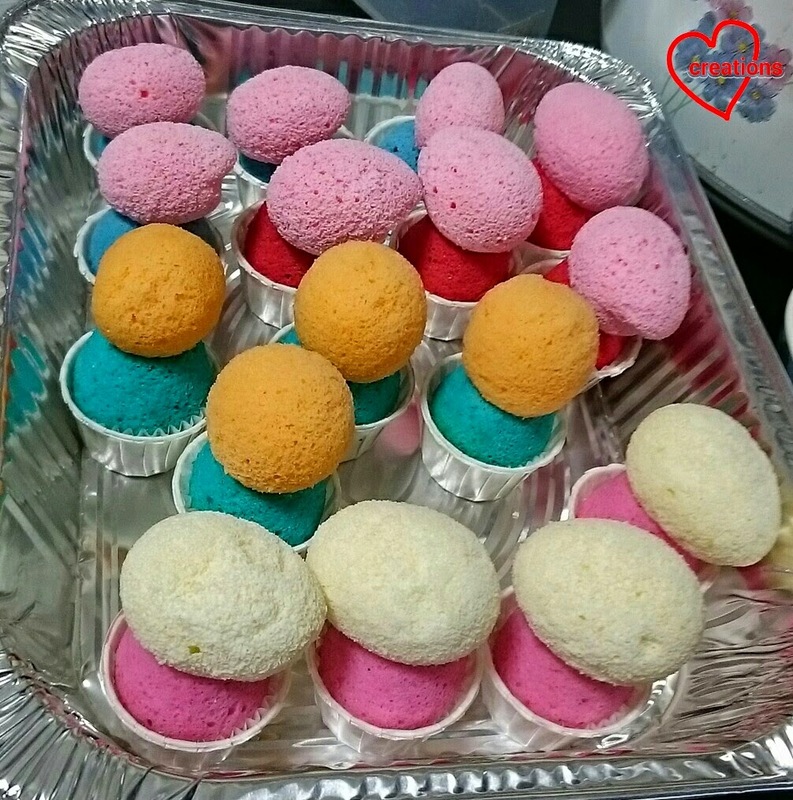 Hi, would like to know if you have done carousel cupcakes or cake pop? 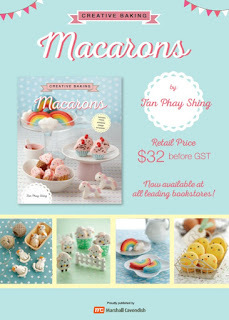 Pls contact me at 90664554, thank you! 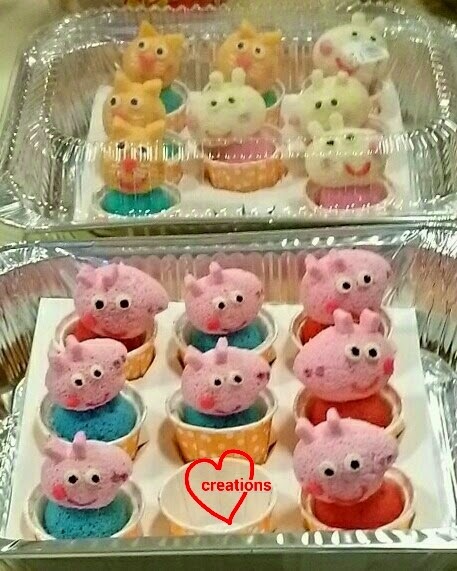 do u take in order for peppa pig chiffon cupcakes? Kindly contact me at 9734 1368. 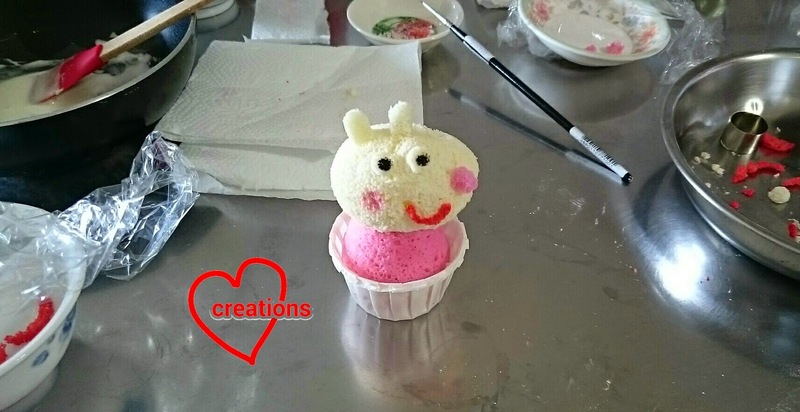 Hi, you can try silicone moulds but those are usually "hemispherical" so it is not possible to get a full 3D head or body effect unless you do some carving or shaping of the baked cakes. Hi, do you take order? pls email me charlene.avenue@gmail.com Thank you!